I am a big fan of Shel Silverstein. 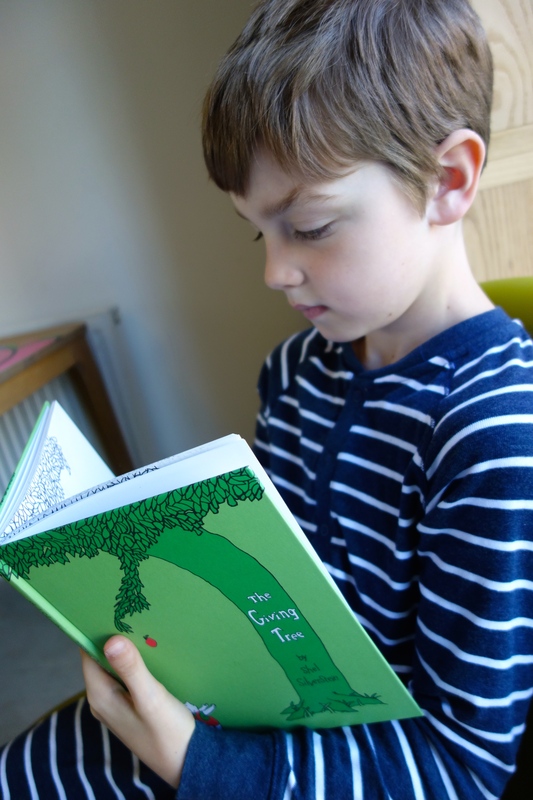 But the The Giving Tree is an admittedly challenging text, raising questions about the nature of parental generosity, filial gratitude and what unconditional love actually means. Kristina Cerise and I debate the merits of this iconic book at Brain, Child Magazine. Lauren writes: The Giving Tree is an extreme version of maternal devotion, a classic case of exaggeration for emphasis. But it is in its extremity where much of the power and beauty lies. I have an emotional reaction every time I read it, a fullness in the back of my throat. While the rational part of me wishes the boy would say “thank you” just once, I still see, at the book’s core, a tale of a deep and abiding love I recognize all too well. And perhaps also an opportunity to think carefully about the nature of generosity and gratitude and what we really expect from our children in return for raising them. Kristina writes: When we teach our kids to approach us with every want, we are teaching them that they are not capable of pursuing their own satisfaction. When we teach our kids that we are the source of all they need, we are teaching them that their possibilities are limited by our abilities and resources. When we respond to their claims that X, Y, or Z will make them happy by facilitating the acquisition of X, Y or Z, we are teaching them that happiness is found outside ourselves. When we pretend that The Giving Tree is a love story, we are teaching our children that loving and giving are synonyms. Read the rest of the discussion here and let us know what you think! a classic tale of maternal devotion or a manifesto for how to raise ungrateful kids? maybe a little bit of both. Knowing your wonderful mother it is easy to see how you have the perspective you do on this book. But, I have to say I think there is much to be said for the opposing view. Excessive maternal “love” can be debilitating in the long run. This might account for the “choked up” feeling reading the book elicits. I like your dad’s perspective. I read this at night and cried and cried and cried. I wondered if Kristina was grasping a bit, reading it too much in the context of today’s hang-ups. But there are a few “old” books I read today and I’m like WHAT? No!! The main reason I don’t read The Giving Tree to my son is that I cry enough, most days, and I don’t need to pile on. Great post, I’m sorry I didn’t respond there more thoughtfully and sooner. I love this book, partly for the nostalgia it brings, but I never really saw it as a judgment on how mothers should be. When I read it I see it almost as a cautionary tale, for both the tree who gives too much and the boy who takes too much. He doesn’t really have independence in the end and while they’re together, I don’t see it as a completely happy ending. But I appreciate its depiction of a relationship that is often true to life, whether between family members, friends or a couple. Thank you for this thoughtful comment, Ariel! I think the book lends itself to many interpretations, and has more than one lesson tucked in its pages. That’s its beauty. I also agree with you that it touches on something true to life.